St Paul with a bifid beard holds a large falchion in his right hand and a scroll in his left, which presumably originally bore the words of the Apostles' Creed attributed to him. The figure of the saint has a bifid beard and the characteristic arrangement of hair on his forehead. He holds a large falchion in his right hand and a long scroll in his left, which presumably originally bore the words of the Apostles' Creed attributed to him. He wears a robe and a cloak draped over his shoulders. The handle of the falchion is missing and the cross-piece is broken. Both the saint's hands are missing. The scroll is broken above hand level. No paint remains. The back of the figure is marked 'X', presumably to indicate it was the tenth figure in the original arrangement of a set of the twelve apostles. There are three lead-plugged holes. A ridge down the middle from top to bottom indicates where two saw cuts met. The bottom has been cut away. On the back of the figure. On loan to the Museum from Dr W.L. Hildburgh since 1930. Given by Dr Hildburgh in 1946. 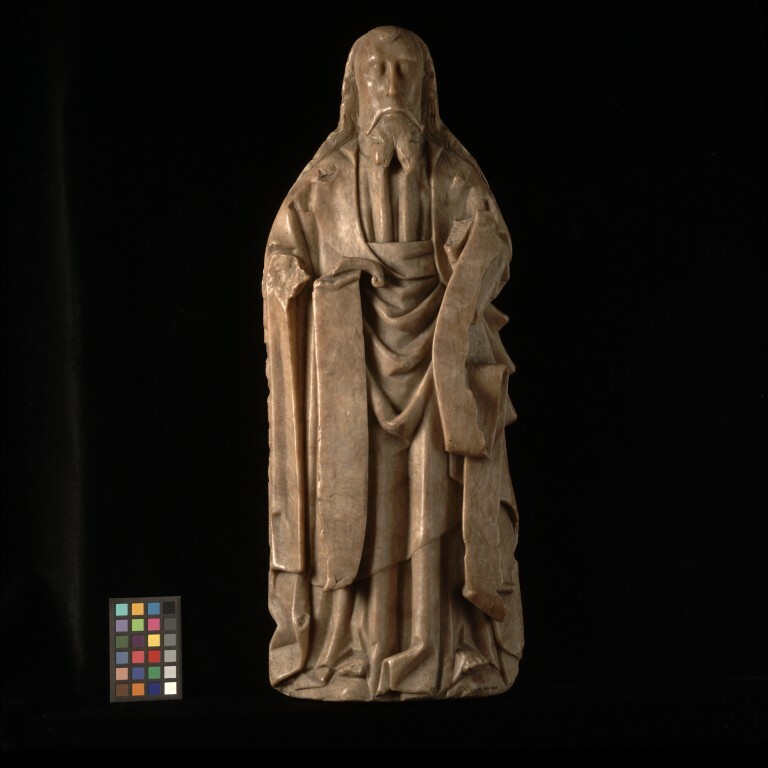 Alabaster statuette depicting St Paul. English, 15th century.